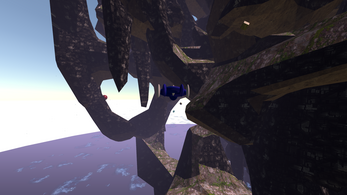 Glider is controlled by gamepad left-stick(keyboard WASD or Vive left-thumbpad) Score by flying closer and faster to the rocks without crashing. A level is completed when you get close to the bottom of the level(a little below the cloud line) and the HUD will display 'Round Over'. Levels 1-3 are ranked on steam leaderboards, Levels 4+ high scores are stored locally. A scoring combo starts when scoring starts and ends after 2.5 seconds of not scoring(flying too far from the rocks to add to score). After 2.5 seconds of not scoring the short run score is added to the total run score. A short run can have a combo multiplier applied to the score at 2000(x2),3000(x3),5000(x4) and 7000(x5) points. 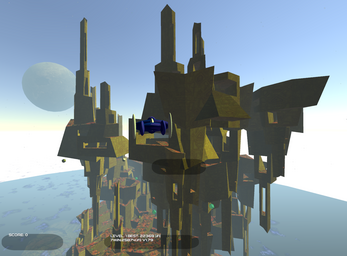 Spinning gold cubes randomly placed in the level are worth 400-1200 points. 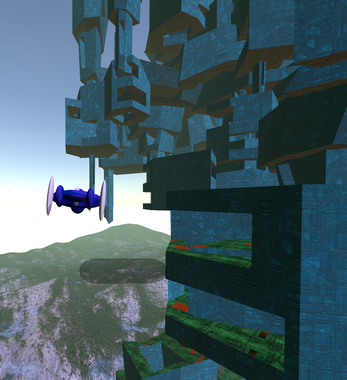 Spinning blue cubes will boost the player and allow the player to regain upward elevation more easily for 3 seconds. 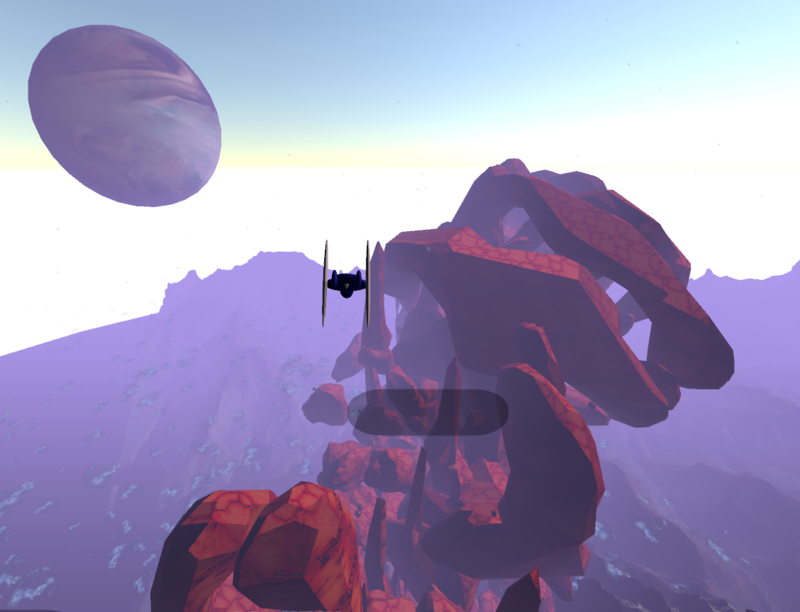 The player 'glider' model wings will get larger or smaller depending on speed to help the player see when they are close to stalling out. Portals on the glide levels are slow-spinning red balls located through the level. Flying into these will send the player to another random level start and change their score from applying to the specific level('best:' in the HUD score readout) to a long-running 'high:' score across as many levels until the player crashes. The glide high score steam leaderboard is 'GlideHigh_201712'. The steam leaderboard Glide7min_201712 takes the highest score for the first 7 minutes of play in a game. This can be over one or several levels, just so long as the game is not restarted which restarts the timer. This '7min' score is shown in the player HUD at mid-screen bottom and a sound plays at the 7 minute mark to let the player know if they exceeded their score or not. Gliding works in VR also and supports head free-look, mainly tested with Vive and gamepad and recommend gamepad for game input. To play without the vive controllers, at the game start, press 'G' on the keyboard or 'X' on the gamepad. Press gamepad 'Y' or keyboard F6 to toggle the HUD score on/off.